Your body is about 60% water. Lose even 1.5% of that H2O , the tipping point for mild dehydration , and your mood, energy levels, and cognitive function all drop, according to research from the University of Connecticut. And while there are obvious reasons you can end up dehydrated — a sunny day, exercise, or not drinking enough in general—other triggers are less obvious. 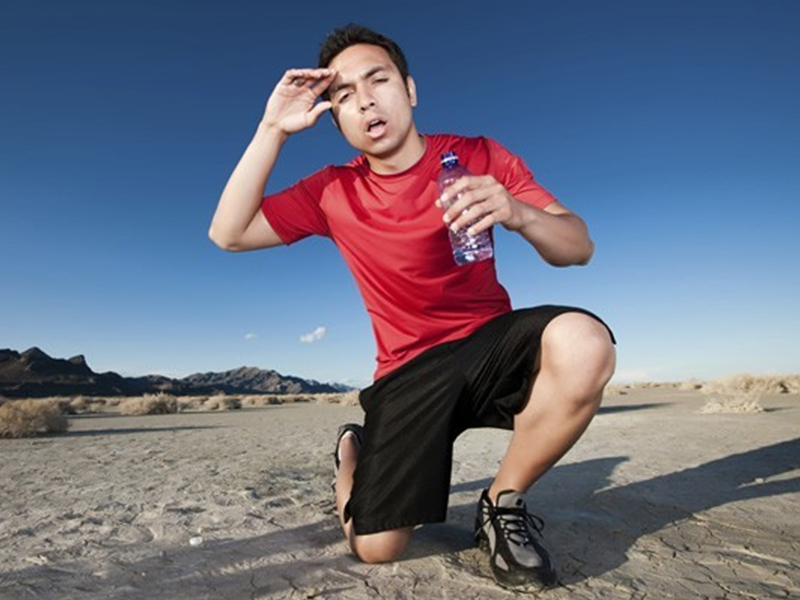 Check out these 8 surprising causes of dehydration and how to prevent them. People with diabetes, especially people who don’t yet realize they have it, are at an increased risk for dehydration. When levels of sugar in the blood are too high, the body tries to get rid off the excess glucose through increased urine output. All of those extra trips to the bathroom can be dehydrating. If you’re diabetic and suffer from frequent thirst or urination, talk to your doctor about how you can work together to improve your blood sugar control. If you’re feeling dehydrated it’s important that you check your prescription’s list of side effects. Many medications act as diuretics, upping your urine output and your risk for dehydration. Blood pressure medications are also a common example. Plus, any drug that lists diarrhea or vomiting as a potential side effect could end up causing dehydration if you experience those side effects. If your prescription hits any of the above, increase your fluid intake. Carbohydrates are stored in your body right along with fluids,that’s why you drop a couple kilos of “water weight” when you eliminate carbs. That might look good on your scale, sure, but it’s bad news for your hydration levels. Plus, since whole carbs such as oatmeal, whole grain pasta and brown rice all soak up water during the cooking process, eating them can actually increase your hydration levels. Cut them from your diet and you could be unwittingly reducing your fluid intake, too. When you’re under stress, your adrenal glands pump out stress hormones. And if you’re constantly under pressure, eventually your adrenals become exhausted, causing an adrenal insufficiency. As the problem arises, the adrenals also produce the hormone aldosterone, which helps regulate your body’s levels of fluid and electrolytes. So as adrenal fatigue progresses, your body’s production of aldosterone drops, triggering dehydration and low electrolyte levels. While increasing fluid intake can help in the short term, mediating your stressors is the only real long-term solution. As you age, your body’s ability to conserve water as well as its sensation for thirst declines, meaning it’s easier so become dehydrated and more difficult to tell when you’re fluids are low. If you have trouble remembering to drink water throughout the day, try making a game of it. Keep some bottled water near you at all times and, each day, keep a running total of how much you’ve consumed. Filling half of your plate at each meal with produce can score you up to to two extra cups of water a day. If you don’t eat your five-a-day, and don’t compensate (at least from a fluid perspective) by drinking extra water, you could easily end up dehydrated. Just because it’s “natural” doesn’t mean is can’t send your bladder into overdrive. For example, parsley, celery seed, dandelion, and watercress have all been shown to increase urine output, which could potentially lead to dehydration. If you are thinking about taking a dietary supplement,or are already taking one, it’s best to speak with a nutritionist or naturopath about any potential side effects. Just because you’re at work doesn’t mean that you should forget to drink water. Sitting at a desk all day is the perfect opportunity to have a glass of water beside you to sip away at, throughout the day. Staying hydrated is especially important if you are working at a labour intensive job, as you’ll be constantly loosing water from all the sweat you’re perspiring. Why not introduce a water cooler into the office and have water available all the time? It might even bring the office closer together as you get to indulge in “water cooler gossip”. Aussie Natural Spring Water specialise in providing both homes and offices with delicious, fresh natural spring water both in water coolers and bottled water. Contact us and rent a water cooler today from as little as $9/month with free Perth metro area delivery!